Breckenridge is a 151 year old Victorian mountain town located at the base of the Ten Mile Range. With it's 249 Historic District Structures, it is among the state's largest National Historic Districts. Breckenridge is a true mountain town that was here long before the ski area. Breckenridge offers casual to fine dinning, a brewery, a distillery, a golf course, Nordic center, coffee shops, shopping, a thriving arts district, and of course world class skiing. 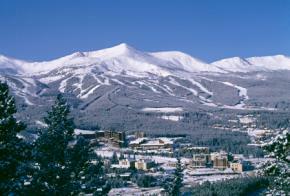 Breckenridge Ski Area is North America's most skied mountain per skier day. The total ski able terrain is 2,358 acres, a summit elevation of 12,998 feet and 3,963 vertical rise. Breckenridge Ski Area averages 300 inches of snow a year.